Please join us at 10:30 a.m. for today’s service led by Rev. Paul Dodenhoff. 18-year old Emma Gonzalez, one of the survivors of the recent school shooting in Parkland, Florida, has become the face of the new student activist movement opposing the NRA and demanding gun reform in America. 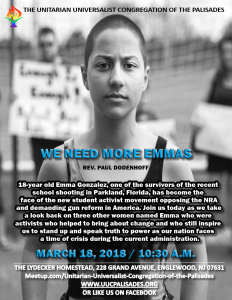 Join us today as we take a look back on three other women named Emma who were activists who helped to bring about change and who still inspire us to stand up and speak truth to power as our nation faces a time of crisis during the current administration.